Vanessa grew up in Maine, spending her high school years with her father in Yarmouth, Maine. Knowing early on that she was called to ministry, Vanessa spent four years attending college in Dublin, Ireland, majoring in Biblical Studies and Theology. She then went on to earn a Masters in Divinity at Harvard Divinity School in Cambridge, MA, graduating in 2013. She was ordained in Yarmouth on March 16th, 2014. 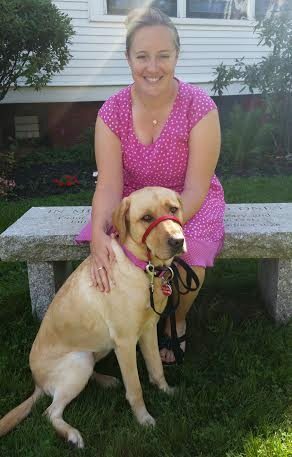 Vanessa has a very special partner in ministry, a ministry dog named Ginger. Ginger is a service dog who was trained by the organization NEADS (Dogs for Deaf and Disabled Americans) to serve the congregation and those in the community. Vanessa and her husband Chris, have one son together named Wesley. They are all very happy to be living on the coast of Maine. Vanessa loves to sail, as well as other outdoor activities, such as hiking and swimming. Vanessa’s mother and step-father live in nearby Rockport, and her father lives in Yarmouth. She also has four siblings both in college and at home. Vanessa brings many gifts to our church. She is extremely energetic and personable, and a strong preacher. She has a compassionate spirit for all ages, and a lovely sense of humor. Her enthusiasm for visiting parishioners, whether at home or in a health care facility, and her past experience as a hospital chaplain intern gives her an added insight and experience to help when needed in that area which means that she is willing and able to include our whole congregation in her ministry. Vanessa currently serves as a volunteer firefighter for the town of South Thomaston and and as a fire chaplain for the town of Thomaston. She also works as an on call chaplain at Maine Medical Center in Portland and at Pen Bay Medical Center in Rockport.